IMG_3394, originally uploaded by martiner1. If you want a cheap, tasty meal, order a soup and pancake from PD on 8th and 44th. $2 total and quite filling. Here's a more detailed description from the blog Cherry Patter. It's "cheap, tasty..", but no way that soup & a pancake for $2 can be reliably healthy food and what are the workers getting paid per hour. I don't know what "codianidad" means, but it's a simple and delicious place. I had the hot and sour soup a few times, and the dumplings are really good. 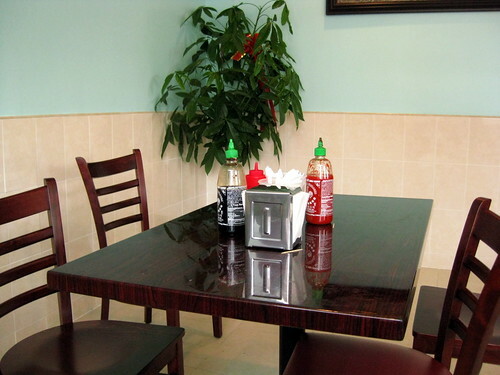 The version in Manhattan doesn't have a lot of space to sit, so this is a great place to hang out with your hot dumplings and soup. To anonymous: The dumplings can be steamed, and compared to a lot of the other places around here (deep fried tofu sticks and cuchifritos), it's not too bad. How much people are getting paid is a good question for a lot of places around here not just Prosperity Dumplings. Stumbled on this place several weeks ago. Gotta love a place that could feed a small army for less than the price of a matinee. That's right, "49th Street". One votes with one's money. If you shop at these places, you're putting your health at risk and promoting questionable (at best) labor practices. Let's all think where and how we spend our money. Chill out Anonymous -- you can always leave a big tip. Thank u to "green light" for at least being honest about where u stand. Throw money at the situation and one can then go about one's business without giving a damn. thanks for the link, and now i really want to come here this weekend. since it's just my son and i (the picky eaters are away) we will be making our way to sunset park for a dumpling meal!